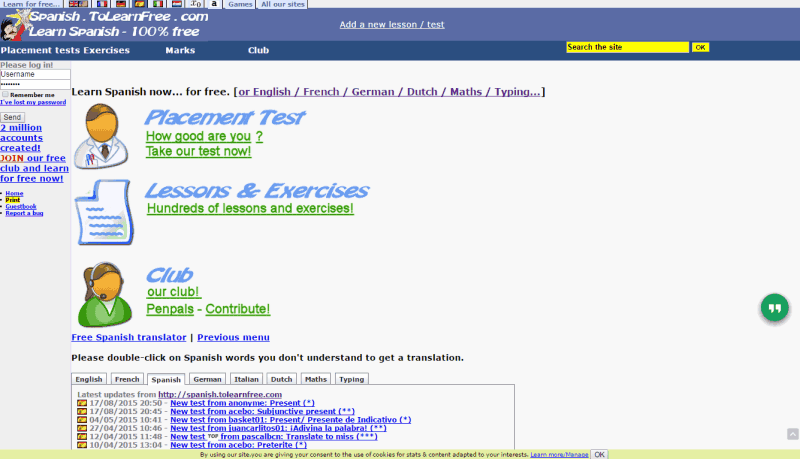 Here is a list of websites to learn Spanish online. 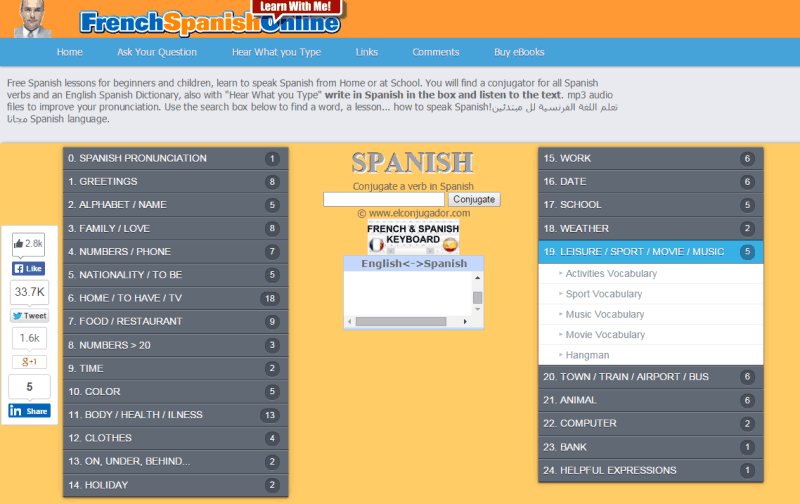 Learn Spanish right from the basics, up to advanced levels of Spanish language with the help of these websites. 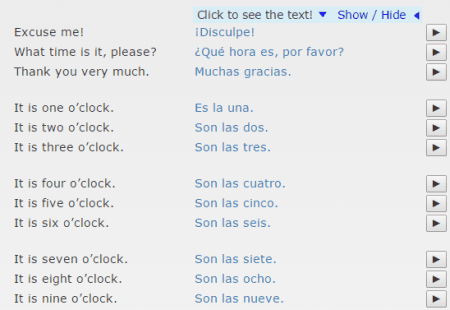 These websites teach you to Write, read, and speak Spanish efficiently. These websites are supported by Audios, and videos to help you with learning correct pronunciations. Learn Spanish, alphabets, numbers, vocabulary, phrases, and pronunciation here. Few of these websites also offer language learning tools, like: Flashcards, Language games, Quizzes, Tests, etc. Spanish is a Romance Language a.k.a. Latin language with more than 410 Million native speakers. It is an official language in 20 countries, including Spain, Argentina, Bolivia, Colombia, Mexico, Peru, Puerto Rico, Uruguay, etc. 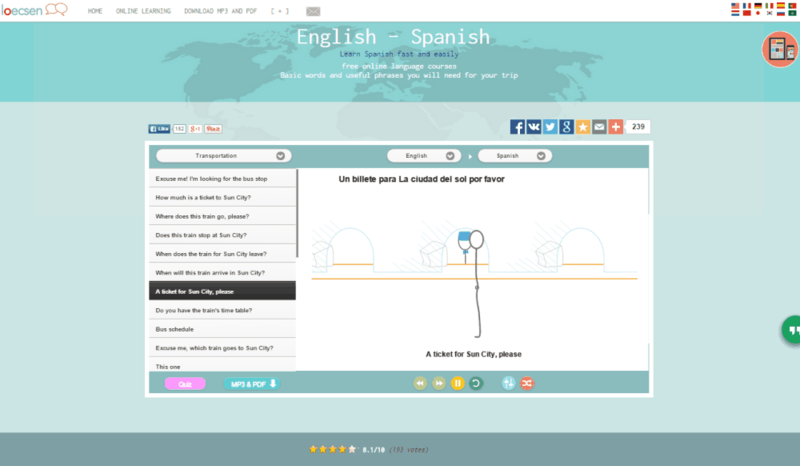 Busuu is one of the best multi language platform, where you can learn Spanish online. You can select from a list of courses available, depending upon your level of knowledge. Doesn’t matter if you are a beginner, an intermediate learner, or an advanced learner, you will get Spanish course for everyone. Listen to audio playback, and track your performance on this website. You can also checkout the list of websites to learn Chinese, Arabic, and Russian language. 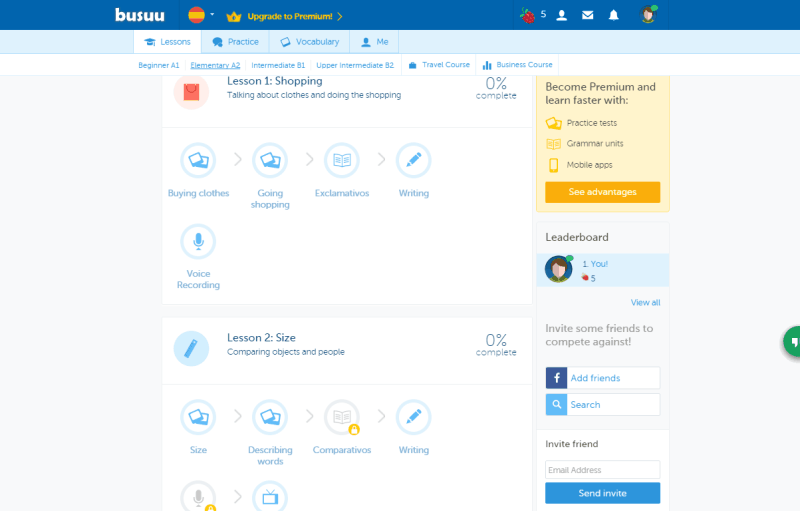 Practice: Its a community of online learners on Busuu. 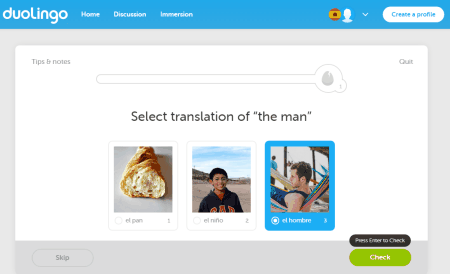 Busuu filters out people who know Spanish and show them on your screen. 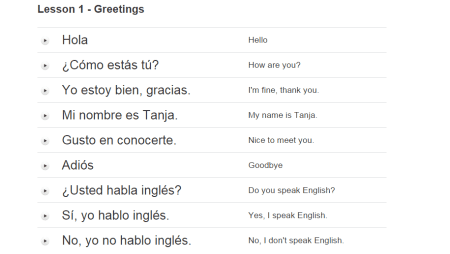 You can start a chat with anyone who is online, and have a conversation to build up your knowledge in Spanish language. Vocabulary: Save words here which you want to practice later, or you find difficult. Visit this section for a revision of Vocabulary. You can learn Spanish for free at Duolingo. 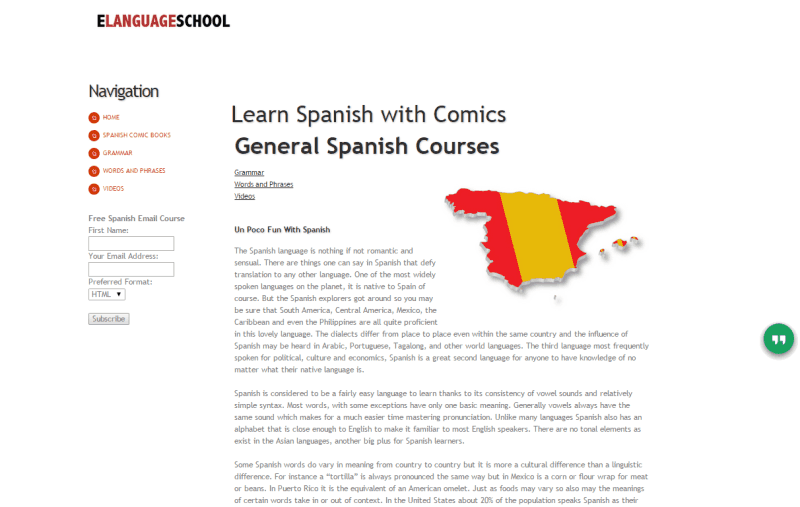 The website provides Spanish language course for beginners, and also for those who already know a bit of Spanish. The modules are supported by audio playback, and need you to interact and learn. You have to take tests at regular interval to check your progress. Learn at your own pace, and save the progress you have made while learning Spanish. 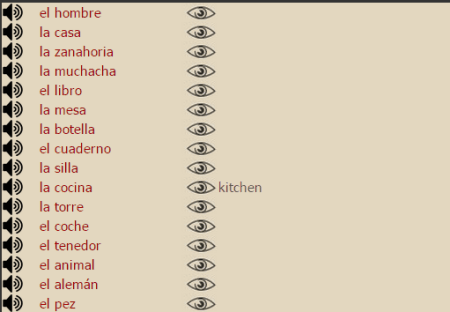 Livemocha is a good website to learn Spanish language. The course can be started by learning Spanish alphabets, numbers, Vocabulary, etc. Once you have mastered the basics of Spanish language, you can get started with Spanish grammar, sentence formation, and phrases. A neat approach has been followed to establish the course, and the audio-video playback lets you grab the basics of Spanish language very easily. Learn Spanish language for free at Learnalanguage.com. 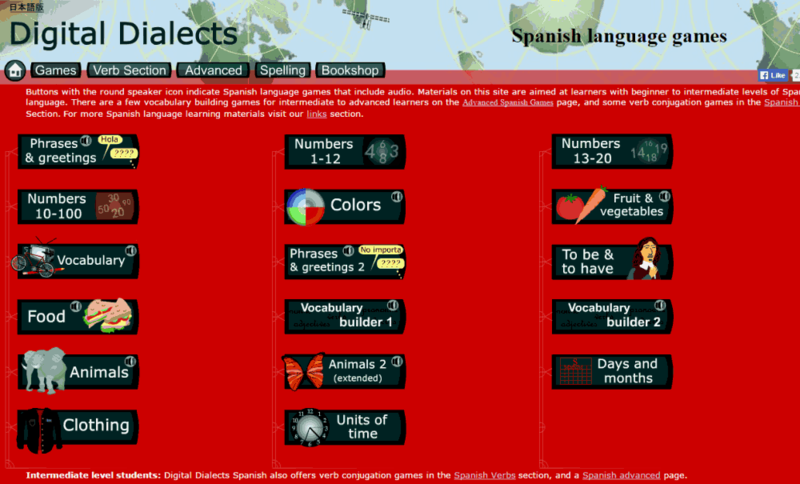 Start from learning the Spanish alphabets in the Spanish Culture section. You also get to know about the history of Spanish language and culture. 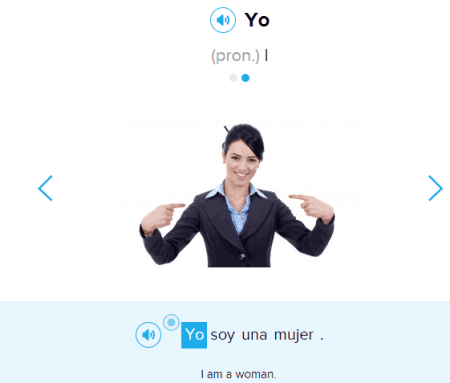 In the Spanish Words, Phrases, and verb module, you get to learn the Spanish translation, and pronunciation of common words, phrases, and verbs. 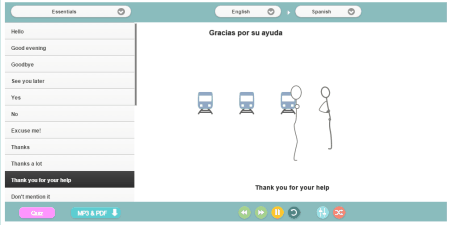 The above modules are supported by audio playback, making Spanish language easy to learn. Visit the listed blog to enhance your skill set in Spanish language. 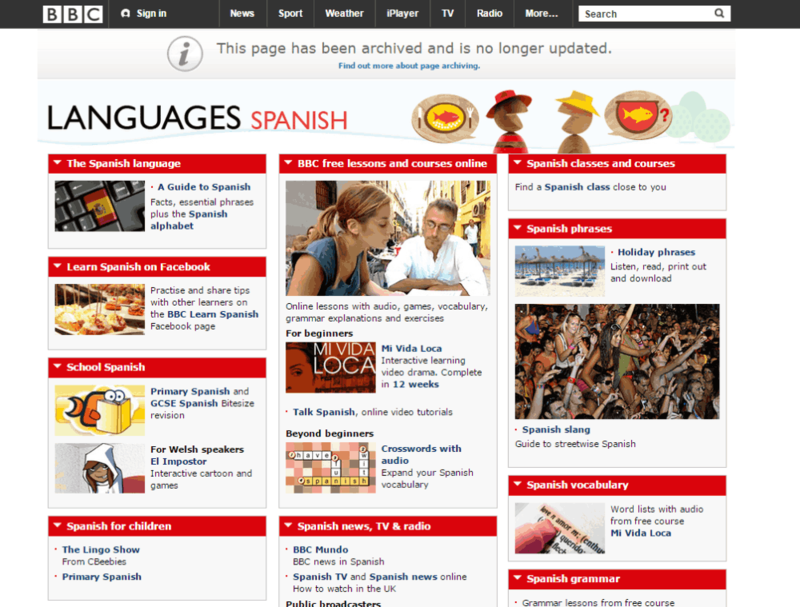 After taking the Spanish language learning course from BBC, you will be able to communicate in Spanish fluently. The course begins with Spanish alphabets and numbers. 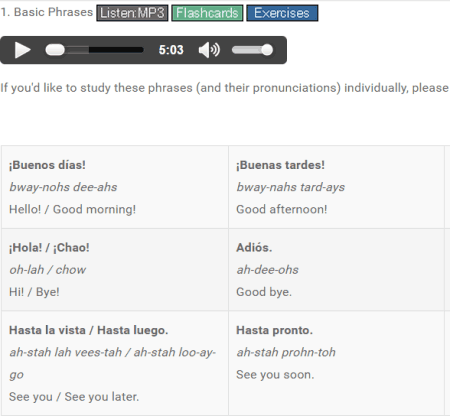 Learn Spanish vocabulary, and pronunciation easily with the help of audio playback. There’s a list of Spanish phrases, which will help you to further enhance your skills in Spanish. 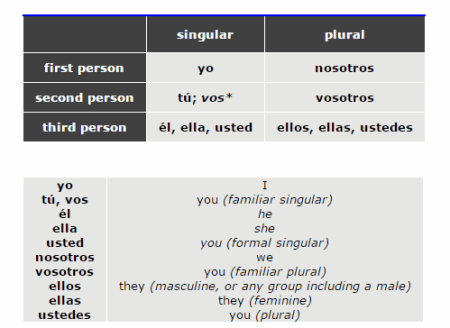 Go through the grammar section, and learn sentence formation in Spanish language. At Loecsen you can learn to speak Spanish language easily. The Spanish language learning course is comprised of conversation based phrases. These phrases are categorized into different sections, based according to the situations where they can be used. You can go through each section and learn translation of each phrase. The phrases are also supported by audio playback. Download the Spanish learning course for free to learn Spanish on the go. 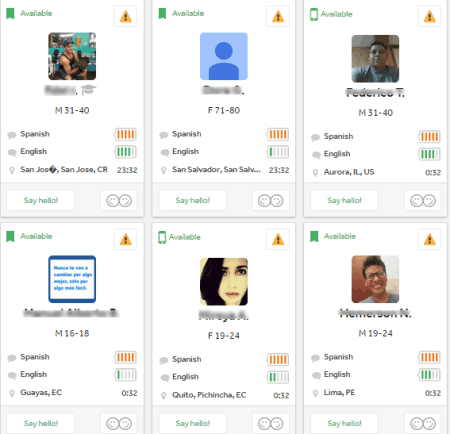 Learn Spanish Language efficiently at Digital Dialects. 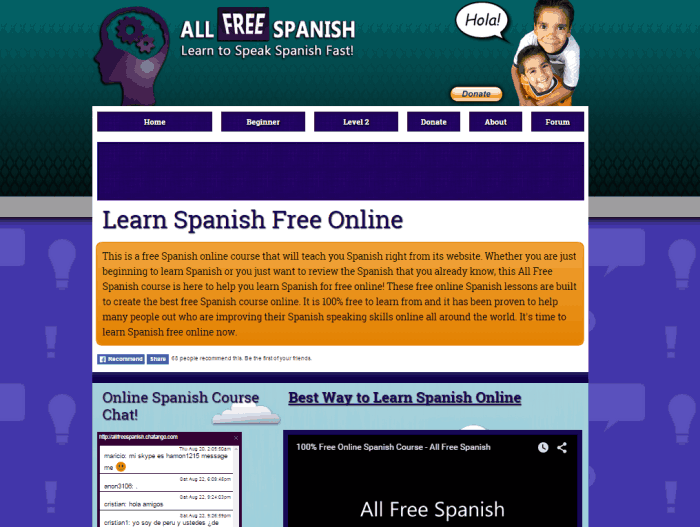 This website offers a Spanish language learning course for free. The course is divided into 30+ modules. These modules are categorized pretty aptly. 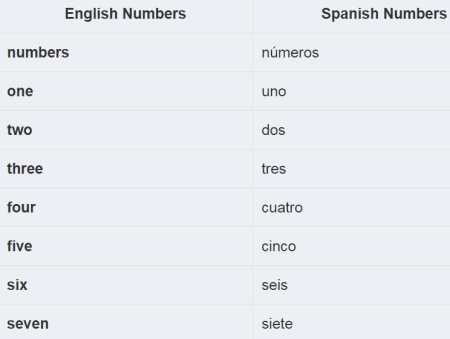 Learn Spanish numbers, phrases, vocabulary, colors, units of time, spelling, and advanced grammar. 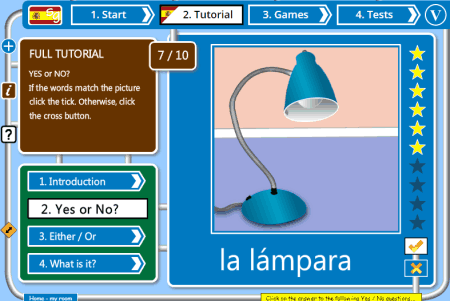 Play free Spanish language learning games, and improve your knowledge in Spanish language. Que Onda Spanish is a language learning platform, which offers free language learning course in Spanish language. Here you can begin learning Spanish with basics, and keep learning till you reach an advanced level. There are courses available for beginners, intermediates, and advanced learners. Various lessons are allocated under these courses. Begin to learn from Spanish alphabets, numbers, vocabulary, pronunciation, and move to higher levels. 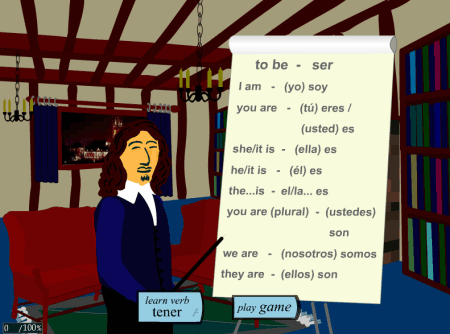 You can also play language games to refine you Spanish language skills. This is one of the best places to learn Spanish language. 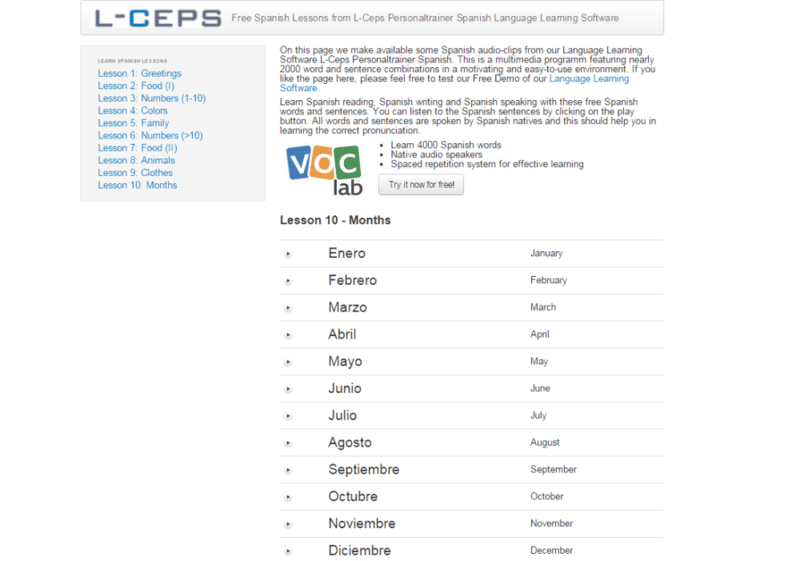 L-Ceps is a multi-language learning platform, and offers free resource to learn basics of Spanish language. The course is divided into 10 lessons. These lessons include translation of words/phrases, based on topics such as introduction, numbers, family, food, months, etc. The translation is available in the form of audio as well. StudySpanish.com has free resources to learn Spanish online. 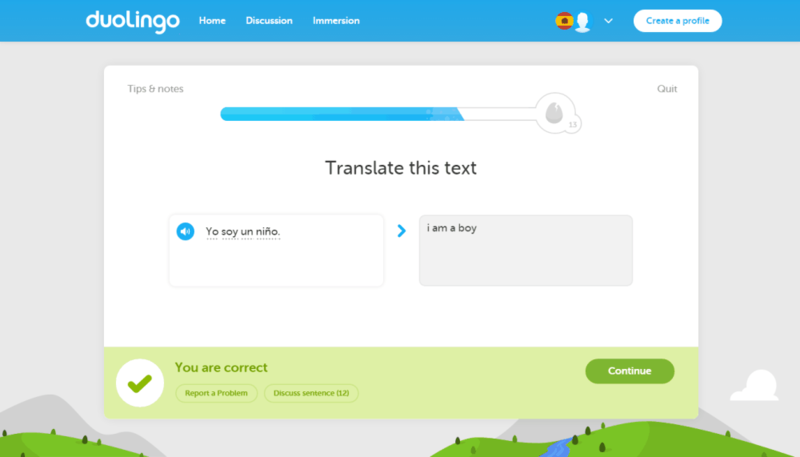 This Spanish language learning course has really vast content. It is divided into 5 parts: Pronunciation, Grammar, Vocabulary, Verb drill, Features, & Resources. 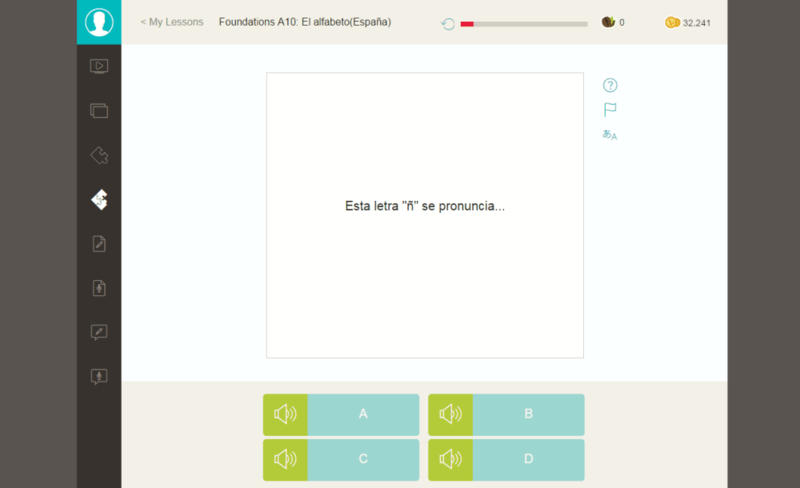 The pronunciation section includes 50 audio supported lessons; these lessons will teach you Spanish alphabets, vowels, consonants, diphthongs, etc. based on examples. Learn Spanish grammar from more than 100 lessons in the Grammar section. 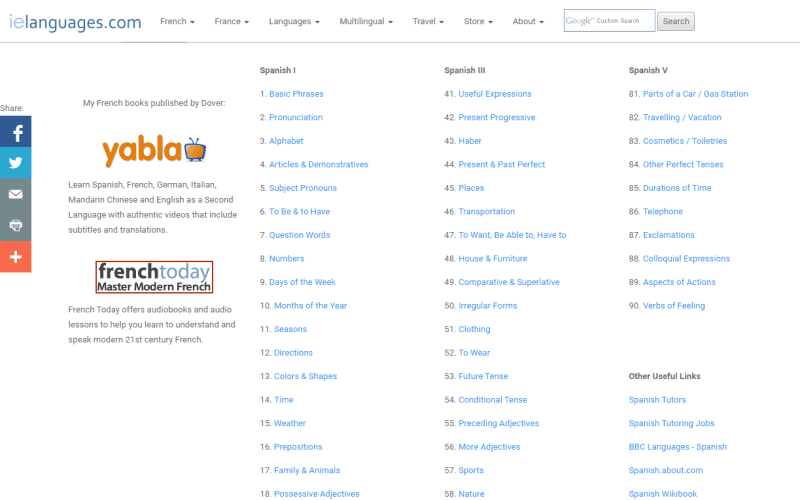 There are more than 50 lessons to be learnt from, in the Vocabulary section. 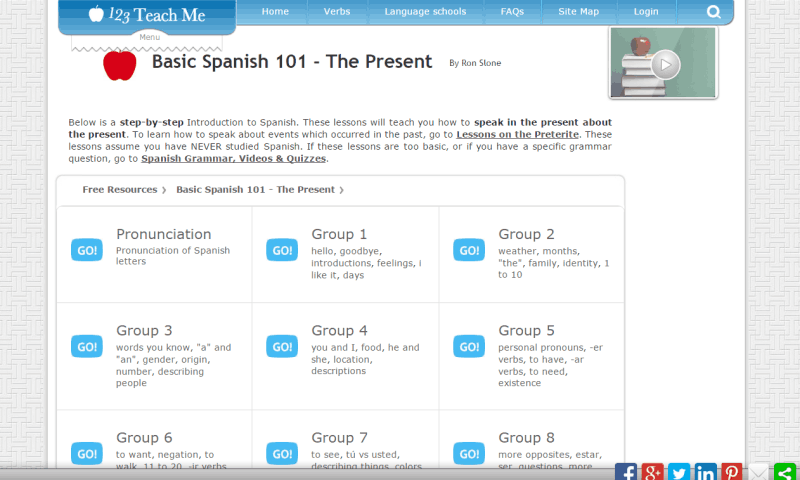 Learn more, and practice on Spanish grammar in the Verb Drill section. 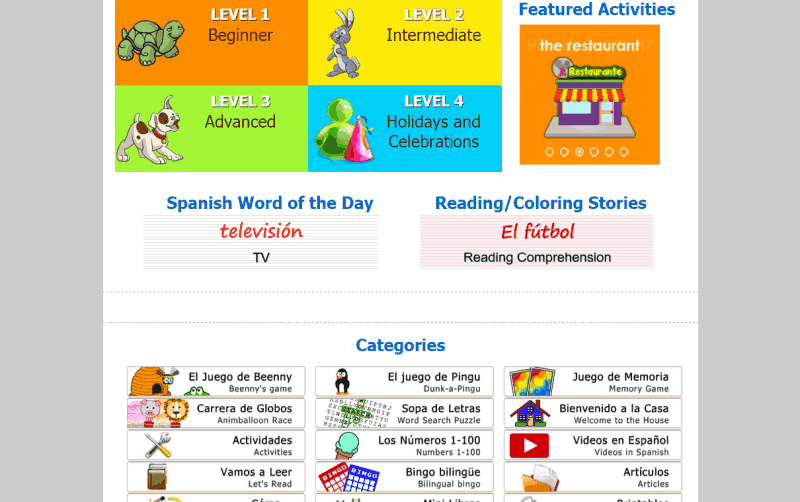 The features & Resources section has multiple Spanish language learning tools. 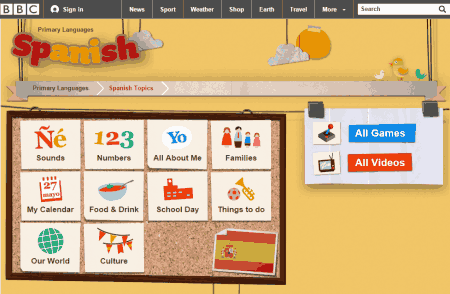 Online Free Spanish is a website to learn Spanish for kids. This online Spanish course for kids has 4 Levels. These levels are: Beginner, Intermediate, Advanced, and Holidays & Celebrations. These levels are divided into various lessons. The lessons in the Beginner level will teach you the basics of Spanish language, such as Alphabets, and vocabulary. These lessons have flash cards, matching games, and other language tools based on different topics. 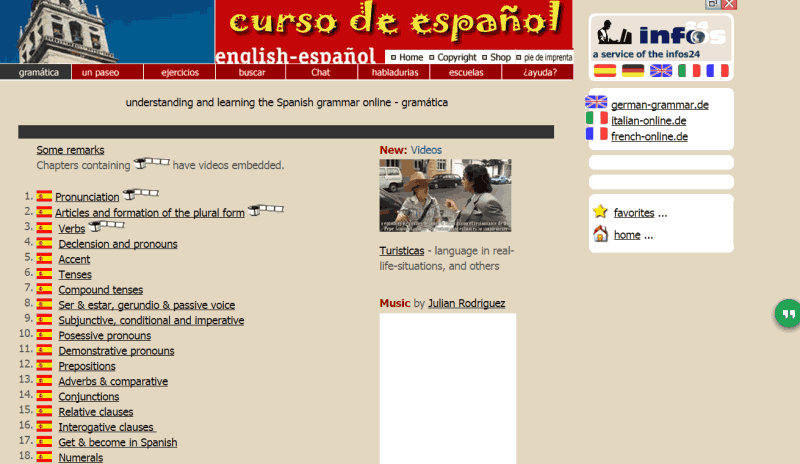 The website uses graphic and audio content to teach Spanish language in an effective way. Overview: Learn the words and phrases with the help of their Spanish translation, and transliteration. Learn Vocabulary: Revise and learn the taught vocabulary with the help of Flashcards, Vocabulary Quiz, and Spelling Quiz. Work with Sentences: Practice sentences with Flashcards, Sentence matching game, and Word order quiz. Review and Expand: Test yourself by taking Multiple Choice Question test. Grammar: This is the most important section of this course. It has audio supported lessons for Spanish grammar. Each lesson is further divided into many sub-lessons. 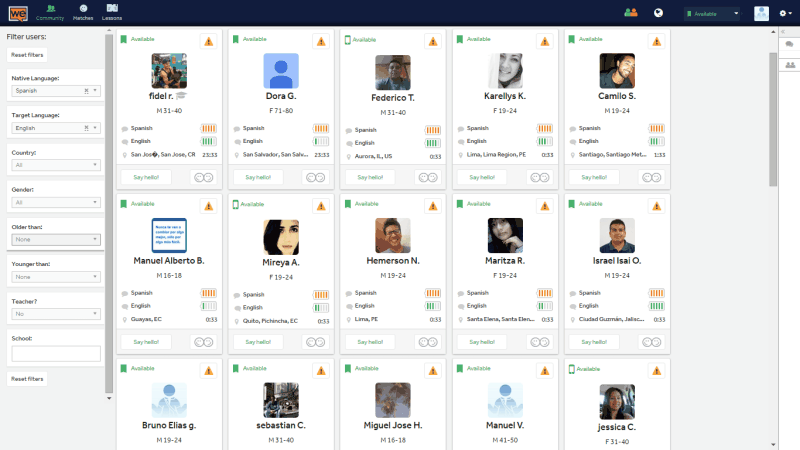 Live Video-Voice chat: Chat with people who know Spanish, and learn more. Forum: If you need help, go to the Forum, and ask a question. Spanish Music, stories, poems, literature, etc: Find various Spanish Stories, newspapers, poems, literature, etc in this section. All of these are in text, and audio playback is also available. Virtual promenade: Take a virtual walk through different Spanish locations, along with a virtual guide. 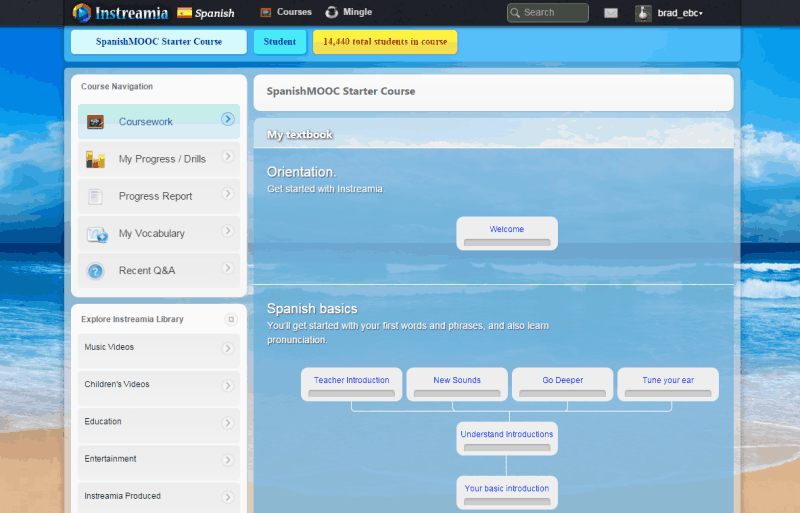 Spanish Mooc is an online course to learn Spanish. Powered by Instremia, it provides educational video clips along with other language learning materials. The course welcomes you with an Orientation module. Then you can begin learning with the basics of Spanish language. Learn new Spanish words and phrases, along with their pronunciation. 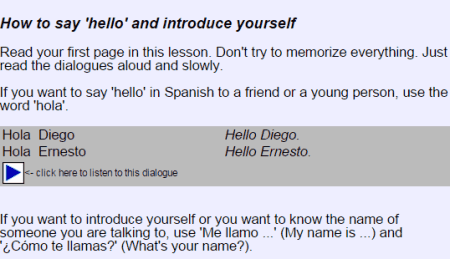 Learn to introduce yourself in Spanish. 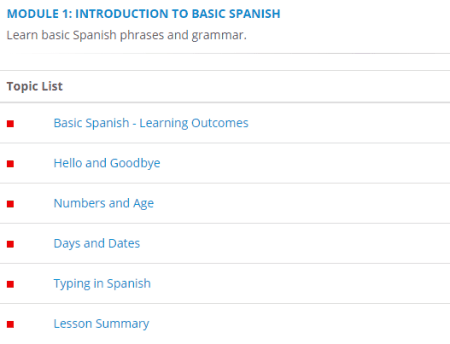 After finishing the basics, you can enroll yourself to Spanish 101. 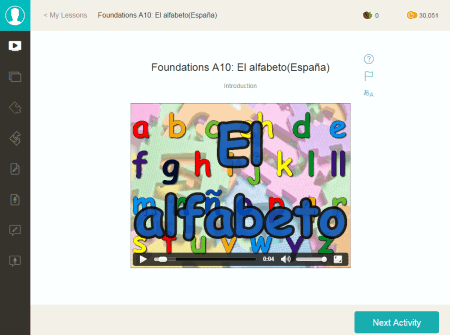 Learn Spanish grammar, alphabets, numbers, and much more in the advanced module. 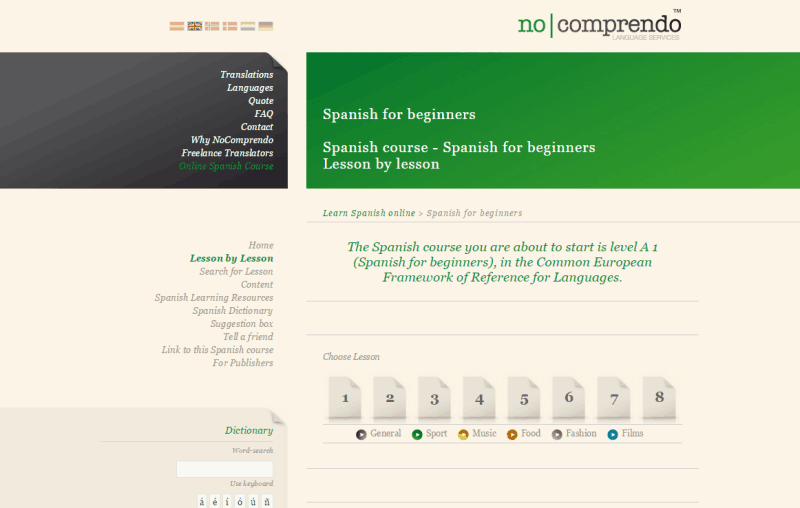 No Comprendo has 8 lessons to learn Spanish language. 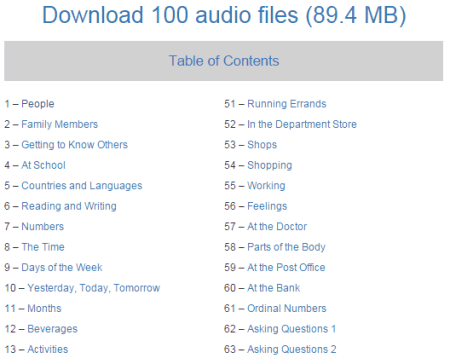 These audio supported lessons are absolutely free to use. Begin learning with the basics of Spanish language, and move on to the advanced level. Select a lesson, and click on the topic you would like to learn. A new window will pop up, with the topic. Learn a topic and move to the next one. Access the Spanish dictionary if you need help. 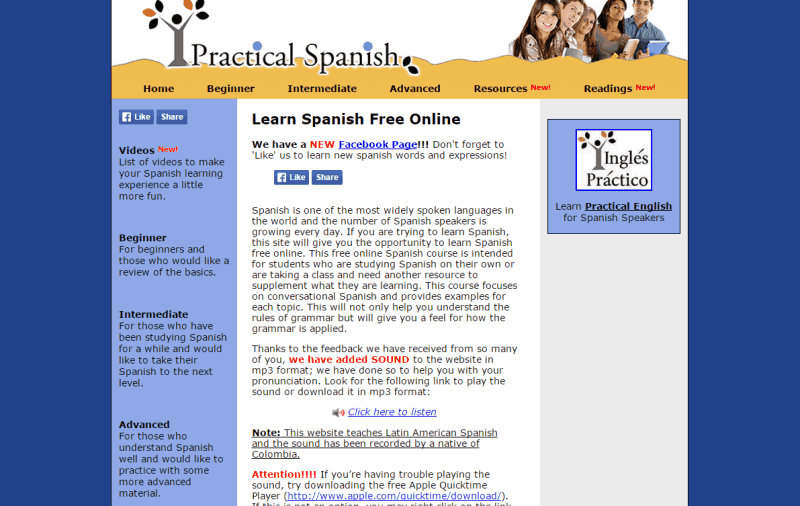 Learn to speak Spanish language for free at Practical Spanish. There are 3 levels in this Spanish language learning course. Beginner, Intermediate, and Advanced. The beginner level has basic grammar, along with introduction, and basic phrases. Intermediate level has advanced grammar lessons. The Advanced level has Spanish reading material to practice Spanish language. The course is fully supported by audio playback. 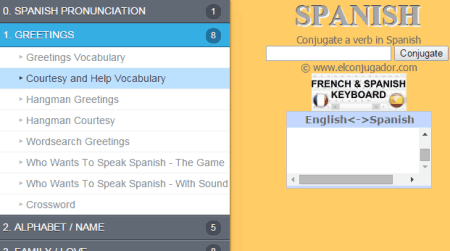 French Spanish online is a multi language learning platform where you can learn Spanish. 24 Lessons are available for you to study Spanish. Each lesson is divided into various sections. The available lessons are based on Greetings, Alphabets, numbers, vocabulary, and phrases. Listen to the audio playback of words and phrases, and learn Spanish easily. You can also find an English to Spanish translator on the website. 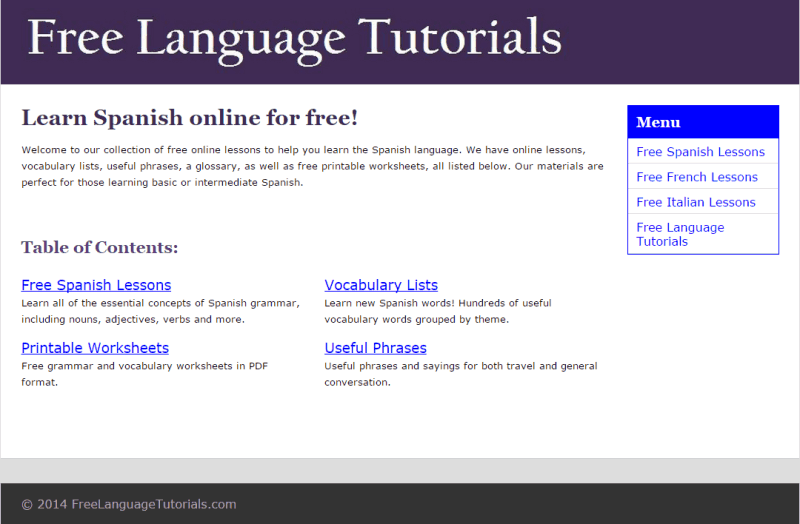 Free Language Tutorials is a perfect place to learn Spanish thoroughly. This website has more than 30 lessons, and lists of vocabulary, and phrases. Everything is explained very neatly. The lists of words and phrases are categorized according to different situations. Audio support is not available, but the curse is understandable pretty clear. Basics of Spanish: Learn the basics of Spanish language, like: Alphabets, Popular words, Numbers, and Verbs. 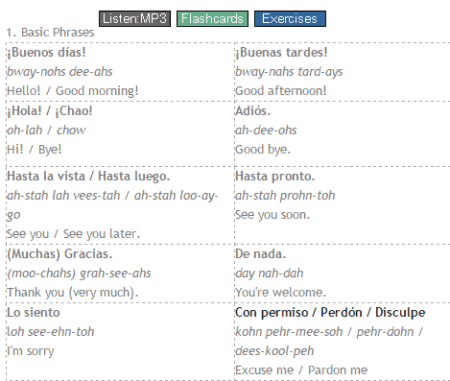 Spanish Phrases: Learn phrases with audio for more than 15 day to day situations. Spanish Grammar: Learn Spanish grammar from more than 30 lessons. These lessons will teach you Spanish grammar step by step. 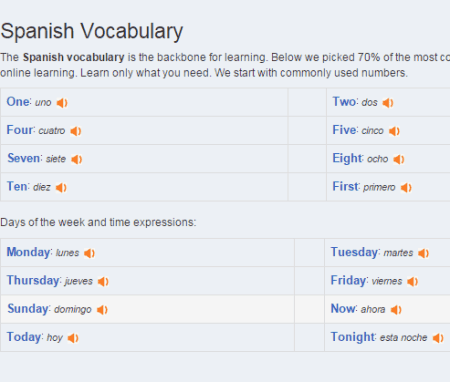 Spanish Vocabulary: Learn a variety of Spanish words, along with pronunciation. 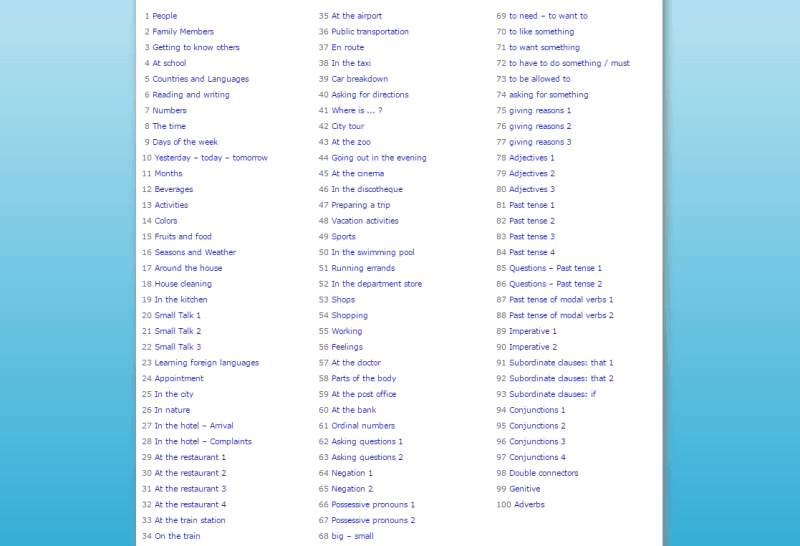 More than 30 categories of words available to learn from. 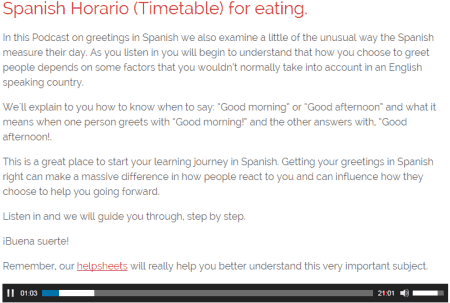 Lingus.tv is a video based course to learn Spanish. This Spanish language learning course is absolutely free to access. It has three levels: Beginners videos, Intermediate videos, and Advanced videos. The videos under these levels teache you Spanish phrases and way of conversation. Look for the conversations, their translation, and notes. The conversations have been framed very carefully, and makes this Spanish learning course very useful for learners. 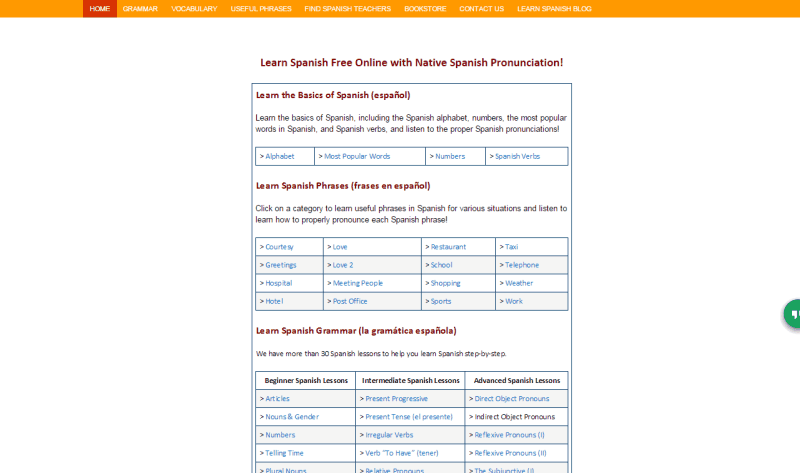 All Free Spanish has 20 lessons in Spanish language, divided into 2 levels. These two levels are Beginner, and Level 2. These lessons start from the basics of Spanish language, like Alphabets, vocabulary, numbers, phrases, and basic grammar. The higher levels take care of advanced grammar. 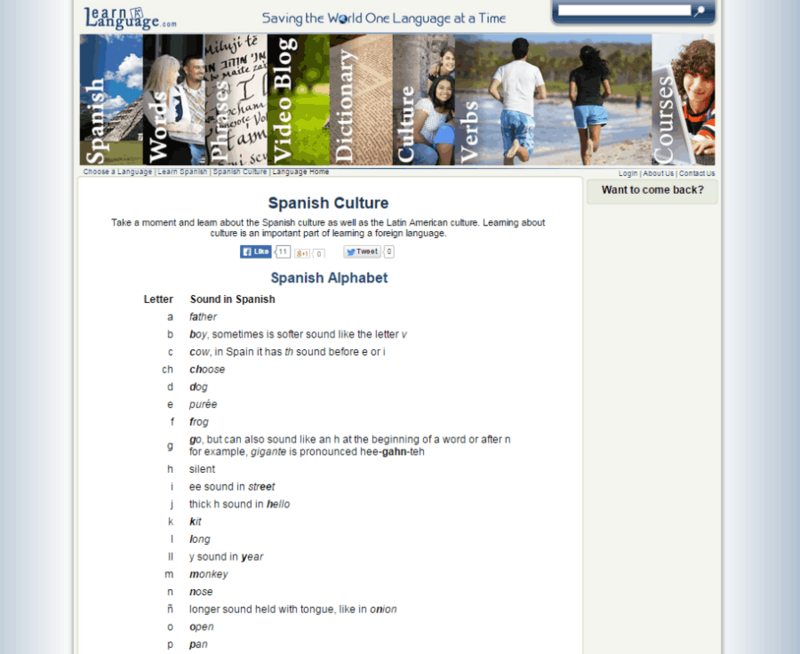 Vocabulary (multiple choice): Learn different Spanish words from various categories. Guess the Spanish translation of words from the multiple choices. 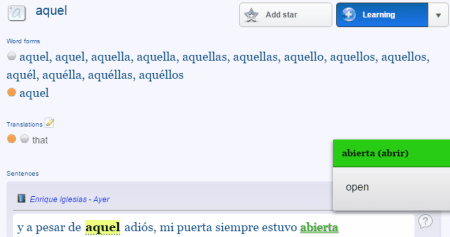 Vocabulary (spelling): Practice and learn Spanish spelling of words. 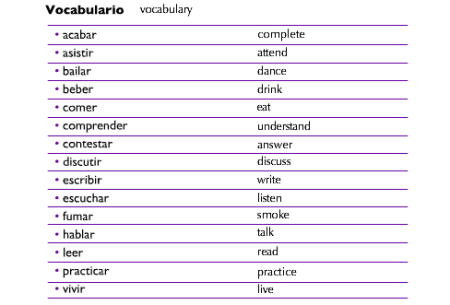 Verbs: Learn Spanish verbs from basics, and how they work. 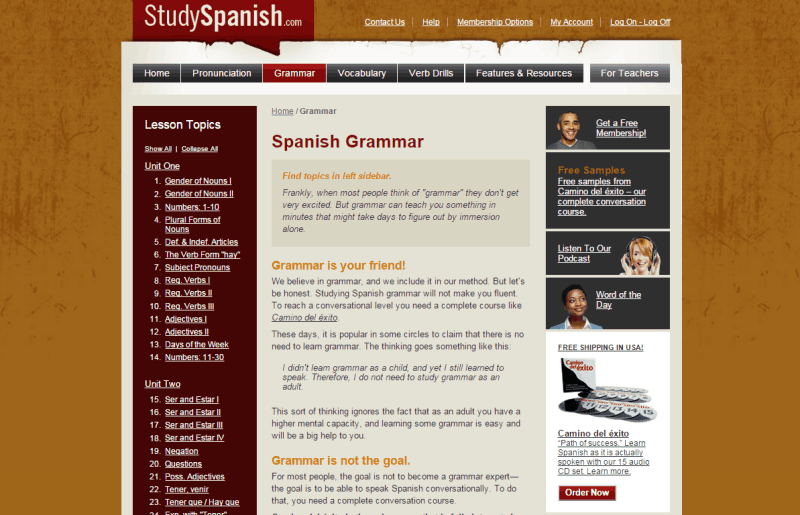 Grammar: Read articles along with examples from 7 lessons in Spanish grammar. 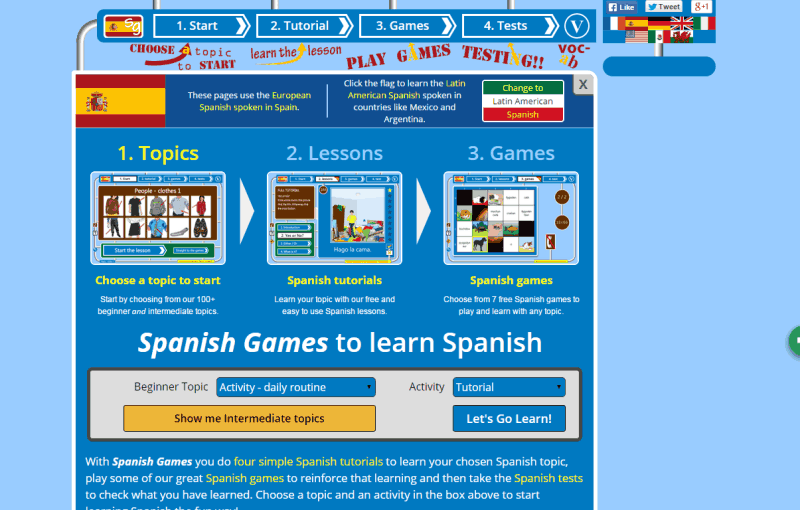 Spanish Games teaches you Spanish with the help of various lessons, and games. Learn Spanish words and phrases, play language games to practice Spanish, and take tests. Once you have learned, you can test what you have learned. This is a very interesting website where you can learn Spanish for free. There are more than 100 lessons to learn from. 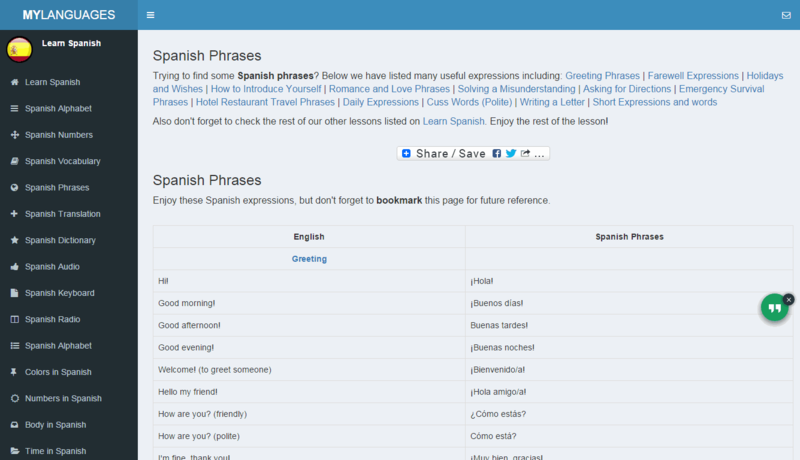 Memrise is a free to use multi-language learning platform, where you can easily learn Spanish. 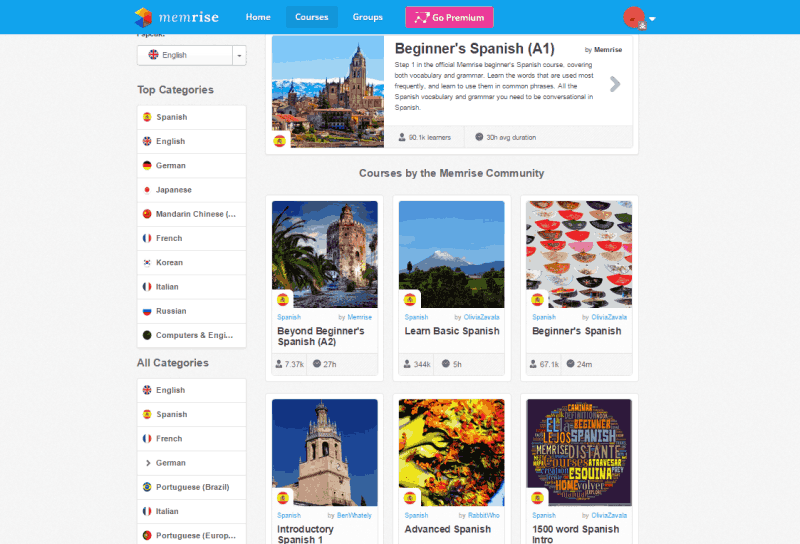 The website has a main course to begin learning Spanish, and various other courses created by Memrise community. These courses include beginners course, advanced course, vocabulary, phrases, sayings, grammar, and much more. You can view the number of learners and the total time duration of the courses, and choose to learn what suits you the best. You can also create a course in your native language if you want. 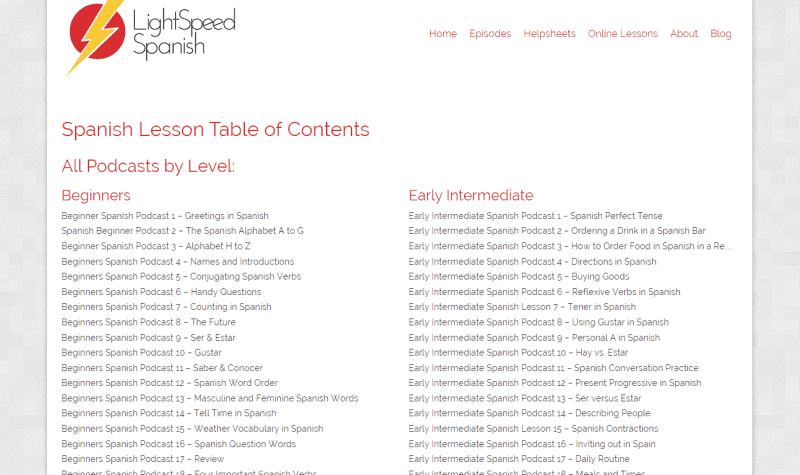 Light Speed Spanish is a podcast based Spanish learning course. The course is divided into 4 parts: Beginner, Early Intermediate, Advanced Intermediate, and Advanced. Every lesson has its podcast attached to it, along with a brief introduction. You can also download supporting PDF material from the lessons. The podcast can be downloaded as MP3 files. The course is basically a conversation between two persons, where one is trying to teach Spanish to another person. BabelNation.com is another good place to learn Spanish. This website has 4 lessons in Spanish language. 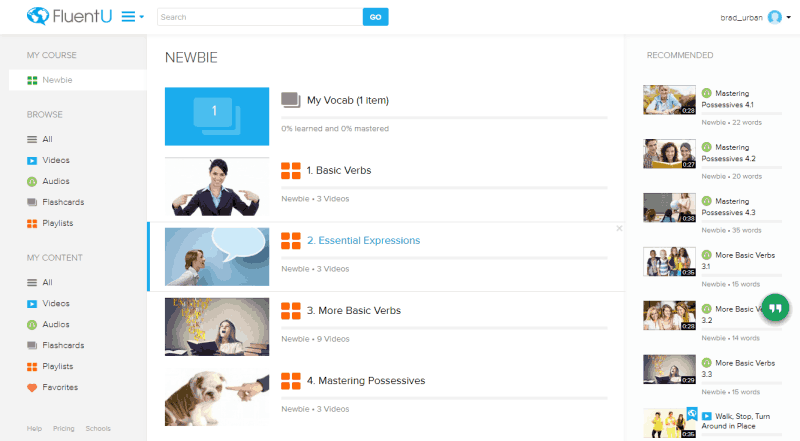 Each lesson is divided into 3 parts: Lesson pages, Vocabularies, and Exercises. The course is completely audio supported, which helps you with learning Spanish pronunciation. 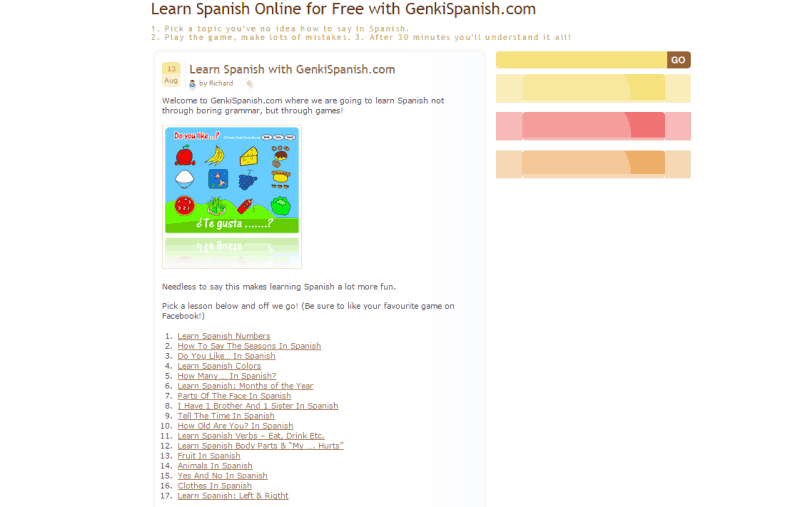 GenkiSpanish is a place where you can learn basic Spanish. 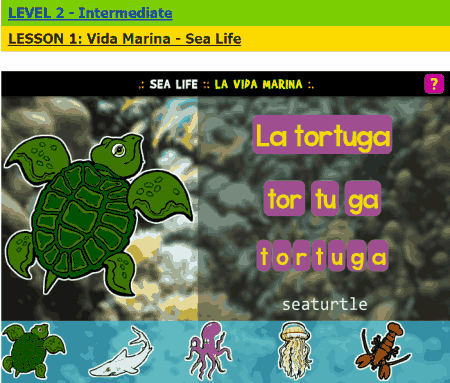 With 17 audio supported lessons, this website is a fun way to learn Spanish language. 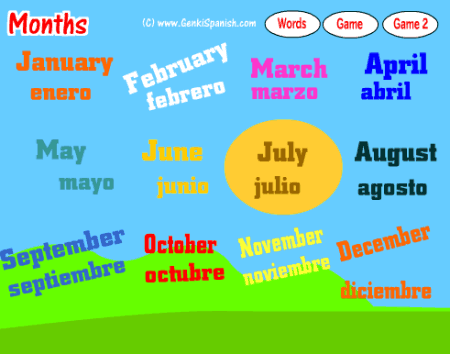 Learn basics of Spanish language, like: Spanish numbers, Seasons, Colors, Time, Animals, Fruits, Directions, and much more. This website is for basic learners, and is specially designed for kids. Learn Spanish for free at FluentU. 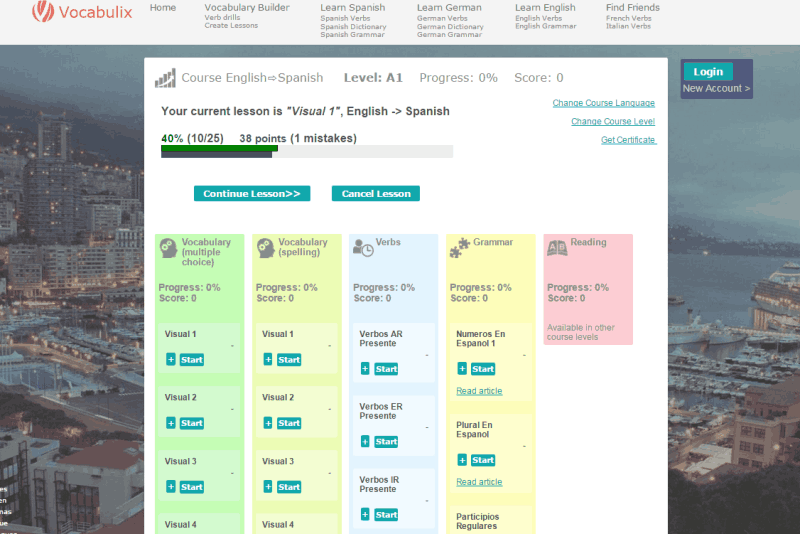 You can choose a level from where you want to begin learning Spanish. Different levels to begin learning Spanish language are: newbie, elementary learner, intermediate learner, upper intermediate learner, or advanced native learner. All the lessons are supported by audio. Learn Spanish characters, words, phrases, vocabulary, grammar, etc. Go through the video tutorial for a better knowledge of Spanish. Alison.com is a website where you can learn different topics online. Spanish language course is available for free on this website. This website teaches you basic Spanish. The course has 2 modules: The content, and the assessment. Learn Spanish alphabets, numbers, grammar, words, phrases, etc. at your own pace on this website. Learn Spanish for free at iLanguages. 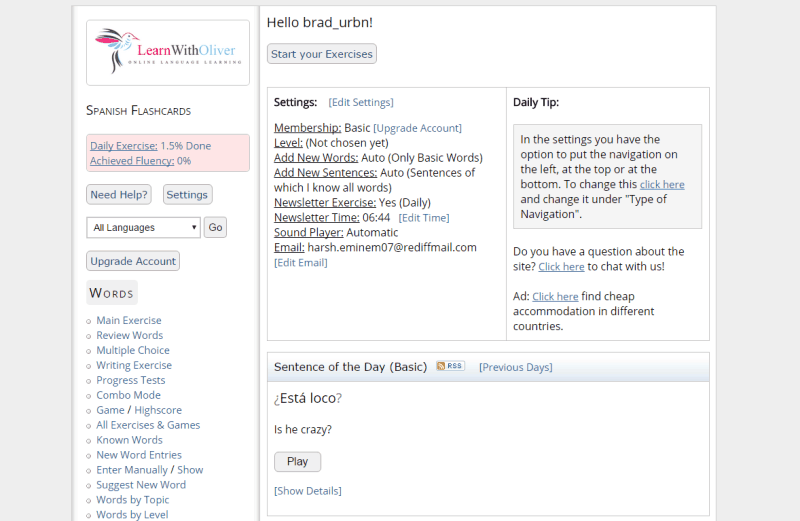 Learn Spanish vocabulary, phrases, grammar, and flashcards on this multi-language learning website. All of the modules here are supported by audio playback. 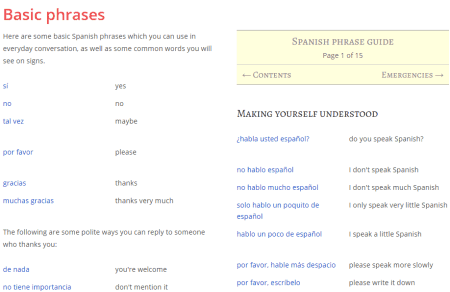 Different lists of common Spanish words and phrases are available here. Begin the course and start speaking Spanish fluently. Learn to speak Spanish on Speak. This course is based on conversation phrases that may occur during different situations. These phrases used in this Spanish learning course are likely to be used at certain places, or given situations. These places and situations are: Introduction, Restaurant, Hotel, Taxi, Bank, Airport, School, Home, Downtown, Market, etc. You can view and listen to the conversations. There are animated rendering of the situation or place to view on this website. At Goethe Verlag you can learn Spanish online. This website has 100 lessons in Spanish language. The lessons are made up of Phrases that we use at different situations and places. 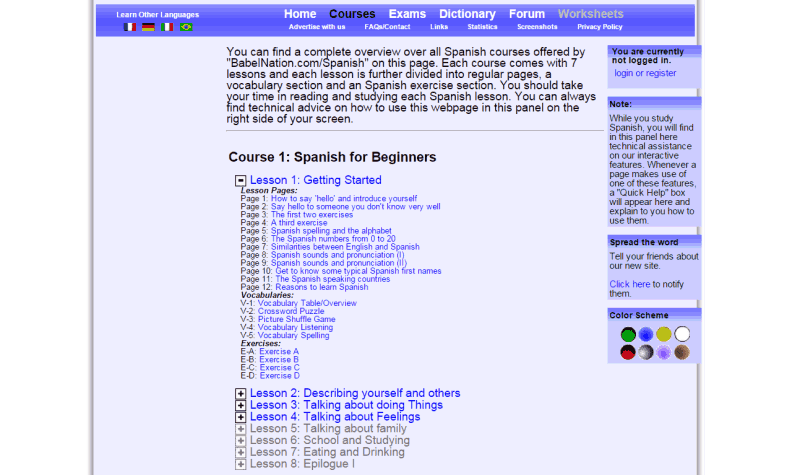 Spanish grammar lessons are also available on this website. 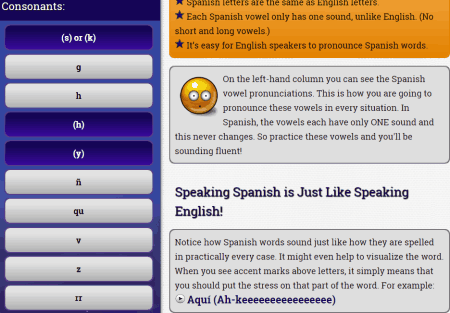 Supported by audio playback, this website helps you with learning Spanish pronunciations. 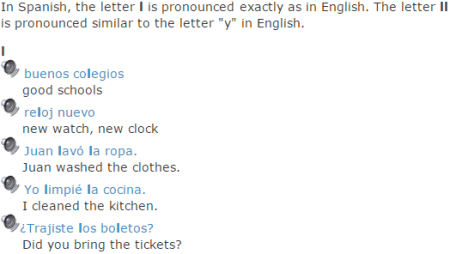 Spanish 1: It has basics of Spanish language, like: Alphabets, Pronouns, Numbers, Time, Weather, Preposition, etc. 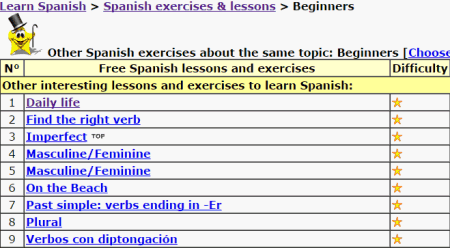 Spanish 2: Consists of Spanish grammar lessons, like: Verbs, Tense, Conjunction, Commands, etc. Spanish 3: This module has advanced grammar lessons, like: Preposition, Adjectives, Phrase construction, Active and Passive voice, and about Spanish. Spanish 4 & Spanish 5: These two modules have more advanced lessons, phrases, sentence formation, etc. All these lessons have audio playback, which helps a lot with understanding the lessons. Learn Spanish for free at SpeakLanguages. This website has free audio supported lessons in Spanish vocabulary and phrases. 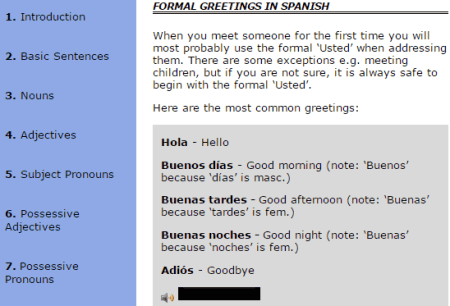 The website welcomes you with a little introduction to Spanish language. The lessons in Phrase and Vocabulary sections are divided into different categories. 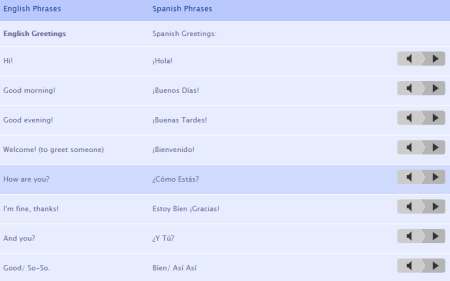 The Language Partner section lets you select Spanish speaking members, and interact with them to learn more in Spanish. 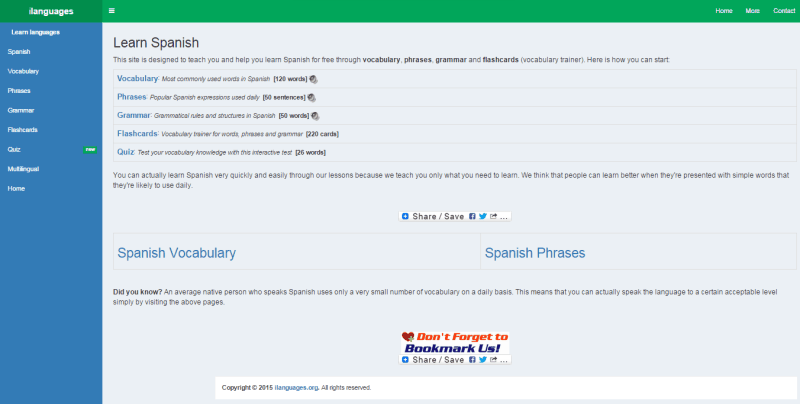 ToLearnFree is a website where you can learn Spanish for free. 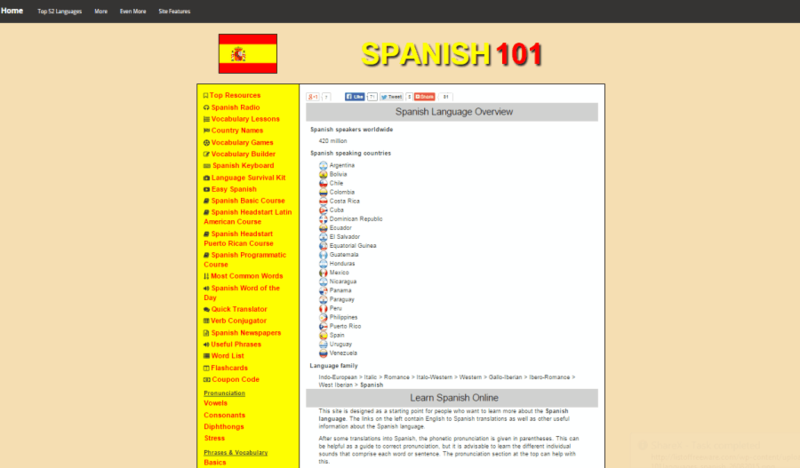 There are more than 50 Spanish language lessons on this website. Take the Placement test to know where you should begin to learn Spanish. You can start learning with Spanish alphabets, numbers, and vocabulary. Advance to further lessons, like Spanish grammar, phrases, sentence formation, pronunciation, advanced grammar, etc. 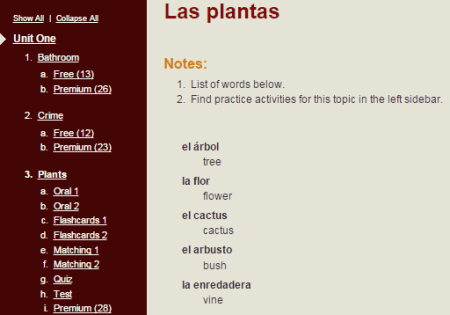 The website is full of exercises and quizzes, practice Spanish with these exercises. 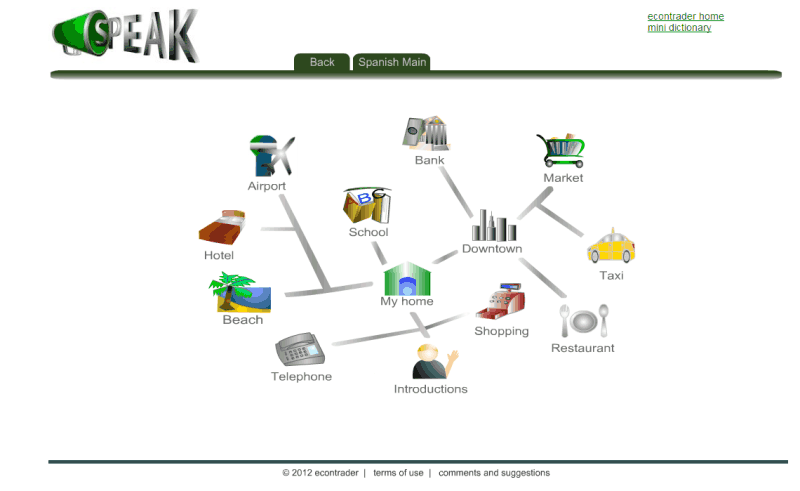 Wespeke is an online platform where you can learn Spanish. At Wespeke you can chat and learn a language from online members. Set filter for the language you want to learn, your native language, age group, country, etc, and Wespeke will show you members according to it. Select any online member, and begin to chat. You can even add them as friends in your profile. 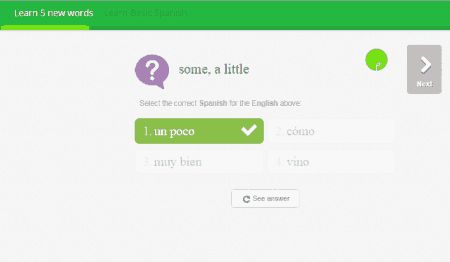 This is one of the best interactive ways to learn Spanish online. Learn Spanish online at Learn With Oliver. 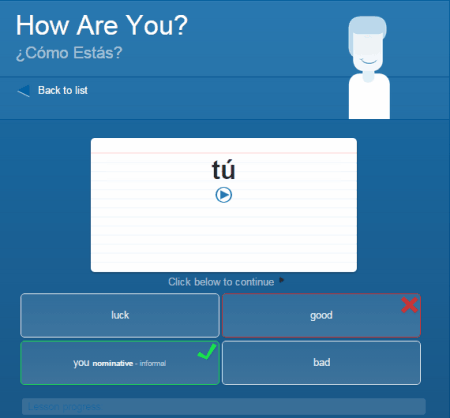 Set your level in Spanish language to begin learning Spanish. 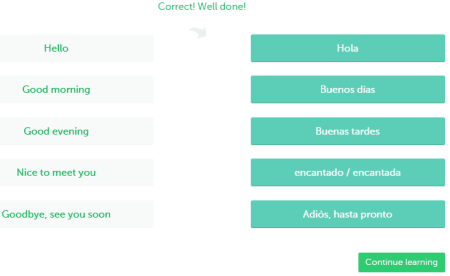 Learn With Oliver lets you practice a bunch of Spanish words and phrases. Listen to the audio to learn pronunciations. There are various set of words and phrases with different level of difficulty. Different exercises are also available to practice Spanish. eLanguageSchool is another website to learn Spanish language. The study material to teach Spanish on this website are: Spanish Grammar, Words, and Phrases, along with educational videos. These videos will help you with building up Spanish vocabulary, and learning pronunciation. 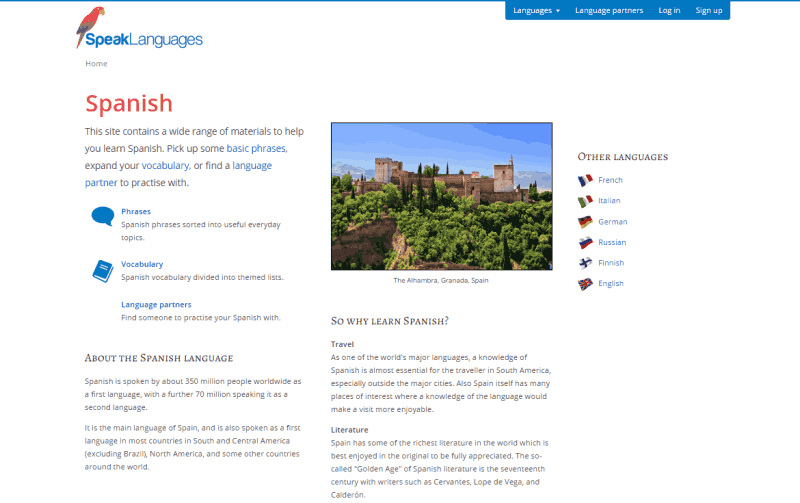 There's a brief introduction to Spanish language, and its history on the Home page of this website. 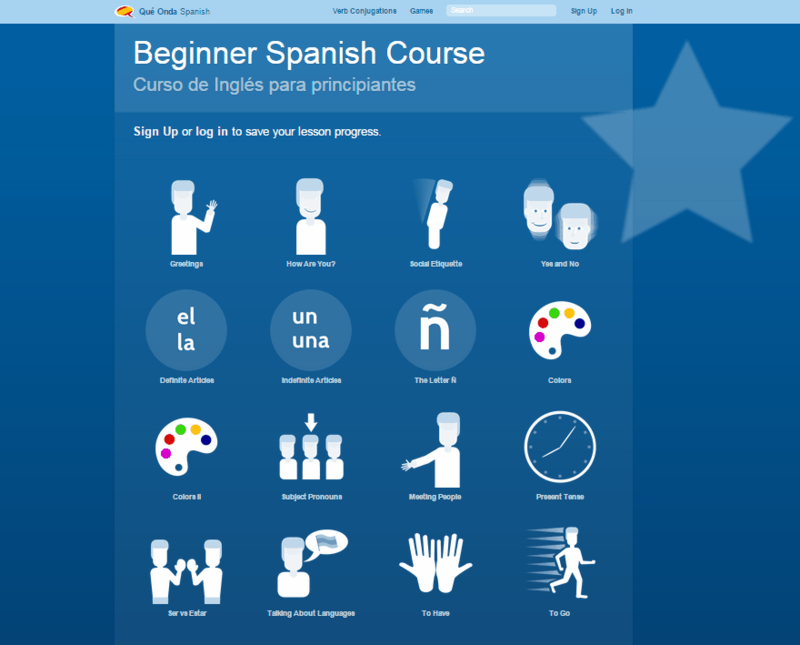 MyLanguages has more than 40 lessons in Spanish language. The course is available for both basic and advanced Spanish. 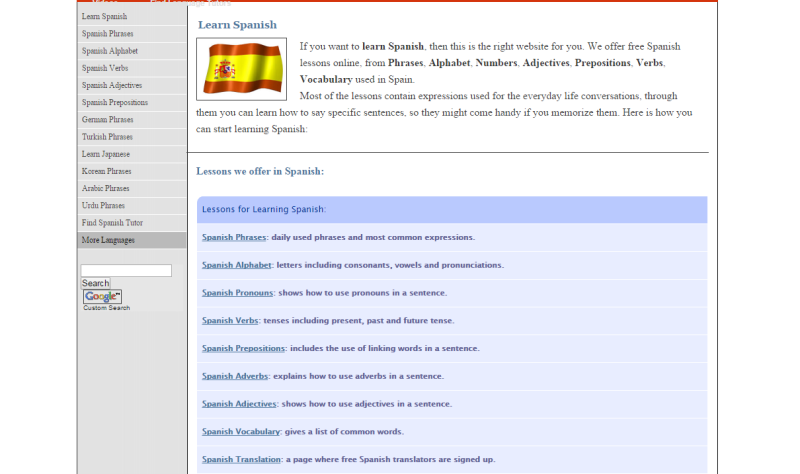 Various lessons available here are: Spanish alphabets, numbers, grammar, vocabulary, phrases, etc. and they are supported by audio playback. Language learning tools like videos, quiz, radio, and transliteration are available here. Learn Spanish for free at Linguanaut. This website has 11 audio supported lessons in Spanish. What do you get to learn on this website? Learn Spanish Alphabets, Numbers, Phrases, Verbs, Adjectives, Keyboard, Symbols, Sayings, Names, Vocabulary, and Translation. The lessons have been crafted very carefully, and are really easy to understand. Language learning tools, games, and quizzes are also available here. 101Languages offers free course to learn Spanish online. 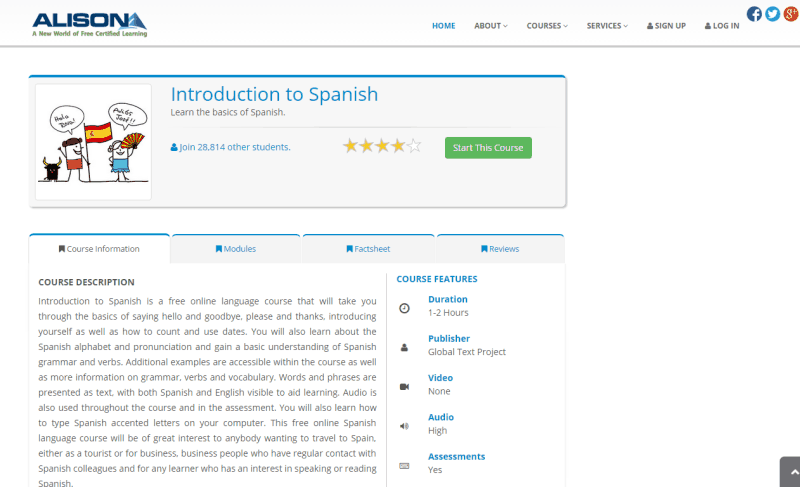 With more than 30 modules in Spanish language, this is one of the best place to learn Spanish. 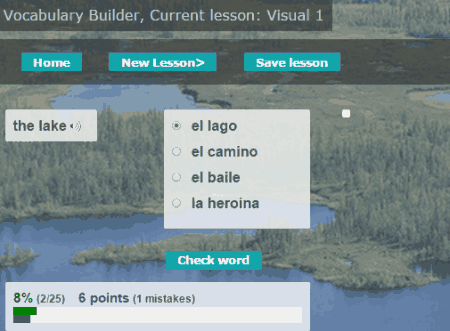 These modules are made up of Spanish lessons, lists, and language tools. Learn Spanish alphabets, vocabulary, and useful phrases, along with their pronunciation. 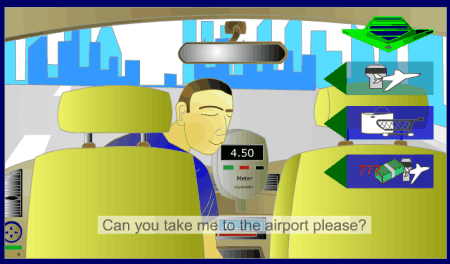 The vocabulary and phrases modules include topics, like: time, transportation, money, eating, bars, shopping, driving, etc. Various language tools available on 101Languages are: Spanish radio, Vocabulary games, Spanish keyboard, Quick translator, Flash card, etc.